The day finally arrived on Wednesday when I took delivery of my new Titanium Orange Brompton. Excited, overwhelmed, delighted are words I could use to describe my feelings on finally getting a Titanium Brompton after coveting one for so long. Today, I took my Titanium Orange wonder out on the streets for an extensive run. In fact I cycled two laps around Richmond Park, then to Hampton Court Palace and then back to Richmond. I started off stupidly early so that I would be back in good time before the troops woke up. Well, here is it. I love it! There, review over. Of course I will go in to more detail as there really is quite a lot to say about this particular Brompton and the many updated components Brompton have released for 2013 bikes. 6 x speed, normal ratio gears. Orange coloured frame in the Superlight Titanium version. (Interestingly my Original Orange non titanium Brompton with the above specifications weighs in at 12.05kg and my old S2L Raw Lacquer is the same weight as my Titanium Orange Brompton). I love the look of this bike! More Orange than my Original Orange Brompton! 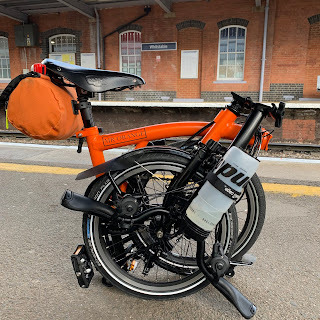 The weight is why many people buy a titanium Brompton as there is a noticeable and quite significant difference when carrying my new Titanium Orange Brompton compared to my Original steel version. This was something I noticed when I owned the S2L. It is of course on the road where I felt the biggest difference in terms of the weight saving afforded by all that loverly titanium. The bike felt lighter and more agile. It is of course an M-type but it reminded me of the responsive, nippy S2L. I liked it and having all those extra gears to play with certainly enhanced the sporty feeling. I opted for the M-type handlebars as being quite tall and as I am going on all sorts of rides as well as my daily commute, the 'M' provides the best all round riding comfort I am looking for. I also love the that fact that it is the original Brompton handlebar. As I have written the weight saving and all those extra gears certainly maintain the sporty riding I experienced when owning a S2L for just over a year. I have a Brooks B17 Special Edition saddle for me Original Orange Brompton but felt this wouldn't be suitable for this new Brompton. Dare I say it but I felt it would be a little dull, boring, predictable even. I think that the Mandarine complements the orange in the frame really well and I am glad that decided to get it. As with other Brooks saddles, I have not had any problem adjusting to it. It felt good and after putting in a good few miles this morning I am none the worse for it. Brooks Mandarine - rather lovely I think. The folded package - I could look at it all day long. The chainset is one of the big changes for 2013 bikes. It is quite a dramatic change and improvement compared to the one on my Original Orange Brompton. There are several changes that combined make a brilliant upgrade. Firstly, things feel a great deal stiffer than the old one. Pedalling is secure and responsive. This is perhaps another reason why I perceive this bike to be quite sporty in its handling. The chain ring is bolted on to the crank arm as you can see in the picture below. This means that if one wanted to, perhaps for races or different types of routes, one could change the teeth for a 44t or 54t quite easily without having to change the entire chainset. Very useful. The crank arms are straighter and feel stiffer than the older ones and the Brompton symbols etched into the metal are nice finishing touches from Brompton. Another welcome change is that the chain guard (which frequently comes off in places on my Original Brompton) is now screwed on. This makes thing more secure and almost eradicates sections of it coming off. Being a Superlight model, the rear triangle, front forks and mudguard stays are all titanium. This is a wonderful material. Light, very strong and I don't know about you but I have always liked the colour. For me the contrast between the bright orange and titanium goes really well. I have added some clear helicopter tape to some of the areas that might be affected by cable rubbing. Even the mudguard stays are titanium. The distinctive shape of the titanium front forks. I have heard many people say that a titanium Brompton gives the user a slightly different ride. Some have said that it produces flex than the normal all steel frame. It is of course early days and I am still getting used to the weight saving, improved chainset, new double walled rims (see below) and going back to Marathon tyres that allows a higher psi than the Marathon Plus on my Original Orange Brompton but I would almost be tempted to say that I have experienced the opposite. This bike feels if anything firmer than the all steel version. It feels sportier, faster, tauter. I am loving all the titanium! The new wheels for the 2013 Brompton have been updated. They have a changed shape and now have a double walled rim. I actually have the 2013 wheels on my Original Orange Brompton as I needed to change them and I already thought they were a great improvement. The first thing I would say was that getting on new tyres is definitely going to be much easier with these, compared to the original. The new rims I suspect add to the feelings of responsiveness and firm handling? Not only do the new double walled rims look better they produce a better ride. As on all Superlight Titanium models the front wheel is a lighter version. Instead of being secured by steel nuts the wheel has a hollow axle, secured by a allen key bolt as you can see in the picture below. Another big change for 2013 bikes is the total updating of the brake levers. The only thing to say about these is that they are almost a different world compared to the old ones! They look better, are easier to grip and when pressed, produce much, much better braking. They also take up less room on the handlebars. The new levers are more ergonomic and easily operated with one or two fingers. Again the Brompton detailing looks really good. These are do good in fact that I am going to get some for my Original Orange Brompton when available. A modest change has been made to the foam handlebar grips. These are now black and straight. I know for many Brompton users the grips are one of the first changes made. Even with the old ones on my Original Orange Brompton I have to report that I didn't have a problem with them. They were not uncomfortable and I had no strong feelings to change them for something else. The new version is more comfortable and black is a better colour and again I have already bought a pair to retrofit on my Original Orange Brompton. The new grips are better. The Brompton Penaclip is identical apart from being matt silver as apposed to a more polished version on my Original Orange Brompton. The Superlight Titanium versions have a different Brompton decal to distinguish them from the all steel versions. This is in slivery colour, almost matching the titanium goodies these bikes possess. I have always liked this design and am very happy that I am now part of the Titanium club. The Titanium decal looks really good to me. I think you might have gathered already that I REALLY like this bike!!! The titanium version is not cheap and adds a considerable amount to the price tag. Do I think it is worth it? Well for me the answer is...yes. On a practical side I like the considerable reduction in weight. The ride seems to be very firm, sporty and responsive as a result. On the more emotional front I love the colour of the Orange against the Titanium. I like the fact that I see less Titanium Brompton bikes on my commute. I love the fact it is more exclusive and perhaps the biggest reason is that I have fulfilled a long held desire to have one. A Brompton is by no means perfect. The great thing about Brompton the company is that they are constantly tweaking...striving to improve. Not the foundations of the deign - which is bordering on perfection. It is all the components, materials and engineering behind them that are tinkered with to exact improvement. Perhaps the best thing about owning a Brompton, whether it be brand new or second hand is how it makes you feel. I am not alone when I write, a Brompton just makes you happy. It allows you to make journeys that would otherwise be much more difficult. You can poodle along...potter around on it. It can be used as a commuter hack. You can go hell for leather and race on it. You can go on long distance tours on it. It a brilliant form of personal transport. If this new Titanium Orange Brompton affords me as much fun and reliability as my Original Orange Brompton, I will be very happy indeed. All I can say at the moment is that things are looking very promising! Excellent description and pictures! The new chainset and levers look very good as does the matt Pentaclip finish. The original swaged chainset and brake-levers were indeed cheapo low grade items. I fitted a Shimano chainset, UN BB and brake-levers to my 2012 Brom which improved the feel of the bike no end from a riders perspective. It added weight which was the downside. 1)Does the chainset have a painted finish - it looks like it might have? 2)Do you wish for a Ti seatpost to complete your bike? (I wish Brom would make this available again). Hello Simon. Thanks for leaving a comment. The chainset doesn't have a painted finish - looks good and a great improvement. Not really bothered about the Ti / Alloy seat post. The weight difference is negligible and I'd rather have something that was reliable. Wow! what a beautiful bike. Excellent blog - yours together with a few others has pushed me over the edge and I'm awaiting my first Brompton in April. Many thanks Gary. I am sure you will be almost counting the days until you get one. It will be worth it believe me. What type/colour etc.., have you gone for? I plumped for a H6R in the raw lacquer. Look forward to more of your orange adventures. Awesome! I'm glad you love it! Congrats! What a wonderful description of your Orange Brom. I can't wait for my first Sage Green M3R to arrive which is due mid April. Keep up the brilliant work. Don't wish to be blasphemous on this excellent site but the sage green does look well. Mine is a sage green M3 (2012) with Brooks saddle. Just returned from a lunchtime ride, having blown away the cobwebs. Hello John. No need to worry about mentioning a different colour to orange. I have after all owned a Raw Lacquer. The Sage Green is a colour I have always liked. In fact a friend is ordering an S6L in Sage Green with Black extremities and I think it is going to look pretty good! Nice review on the Ti version. I'm really looking forward to owning one after just having ridden the M6R for 2 months. Holding all mods now till the next one comes, perhaps in a matter of 1.5-2 years. No intention of changing the grips to one with bar ends? Great report on your Orange Brompton. Very useful information. I am very excited to announce my ordering of a Brompton very close to yours. My M6L-X will be in racing green, have the 12% reduced gearing for Seattle streets, the Brompton kevlar tires, the Brooks B17 Special in brown, and the tool kit. I'll also be rocking the Mini O bag in apple green. Hope it doesn't clash with the racing green. I look forward to more of your Brompton adventures. Many thanks for leaving a comment Ty. Your bike sounds great and you'll love it when you finally get it. The mini O bag will compliment things well. Let me know how you get on with things when it arrives. I don't fancy the dual gear change levels on the Brompton. Is it possible to replace it with one of those hand-twist gear change like those on mountain bikes? Just a wild thought. Which brand/ model will fit? Many thanks for the kind words and leaving a comment. It probably is possible but it would be quite a tricky thing ensuring the fold isn't compromised. The two triggers are surprisingly easy to master and takes little time to get used to. In addition they keep the weight down. Within a few minutes of riding you'd be okay with two triggers. Oh and definitely go for the 2013 model. It is worth the wait!! Great bike and great blog mate. My titanium Brompton is 6 yrs old now its had regular use on the streets of London, and I love it, however cracks are starting to appear in the titanium frames(literally). I'll probably replace my titanium parts with steel to save costs. I changed handlbars a couple of times to be on the safe side (not expensive) but missed the fatigue on the folding pedal which snapped while on the road - could have been nasty but I was lucky. I'd recommend Brompton owners check regularly for metal fatigue after three/four years of riding. It's a very jolly colour isn't it? I really like this!